SJ Healthcare is a powerful multipurpose responsive template crafted for doctors, dentists and health clinics or any other medical related websites. Its fresh and clean design makes it applicable for corporate websites, personal blogs, product-oriented sites as well. Healthcare comes out with many cutting-edge features. It is totally responsive and working well on any devices, web browsers. 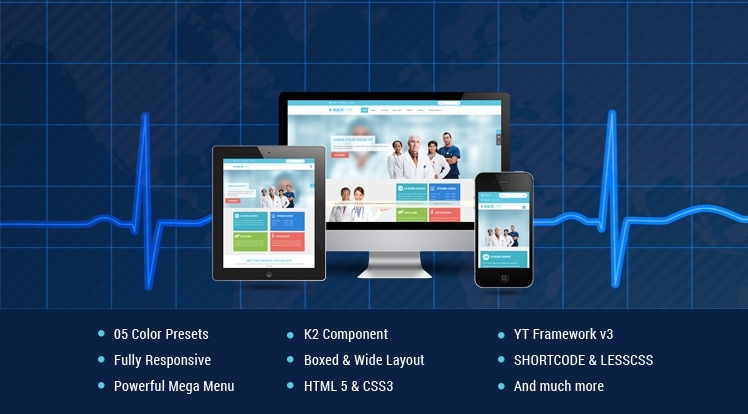 Furthermore, based on the latest YT Framework version, SJ Healthcare allows you to easily control, customize your website in seconds without much coding knowledge. The template is released in 5 color styles: Blue (default), Brown, Green, Pink and Violet. You can preview how they look as well as customize the Layouts, Menus and Reset instantly by using dynamic Cpanel through a standard web browser. Equipped with K2 component and many content related extensions, SJ Healthcare completely adapts any daily news and magazine websites with up-to-date international news, weather, travel, entertainment, finance, sport and more. Discover this eye-catching template more here! This package includes template, modules, plugins and sample data. By using this package, you will have a complete site look like demo site. Modules and plugins used for the demo. - Fixed quickstart installation error.